Modern design created in a trendy sea grass basket. For the budget conscious. Posy style mixed seasonal mini box arrangement. Great for coffee table or hospital. 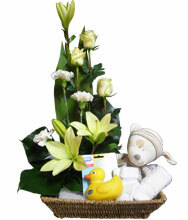 Selection of seasonal flowers with teddy bear and baby novelties presented in a gift basket. 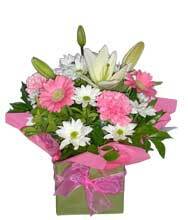 Available in a boy, girl or neutral theme. Why not add a helium balloon to set this off? For those that love tradition. 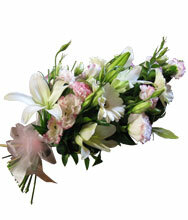 Seasonal selection of flowers arranged in a front facing design. 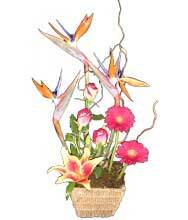 Just choose a colour scheme and we will create something beautiful for you. 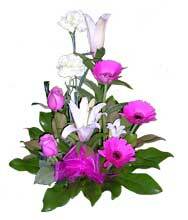 Seasonal selection of mixed flowers designed for placement at Funeral.